I have always been kind of adventurous when it comes to gastronomy and taco carts are one of my favorite places to try new things. 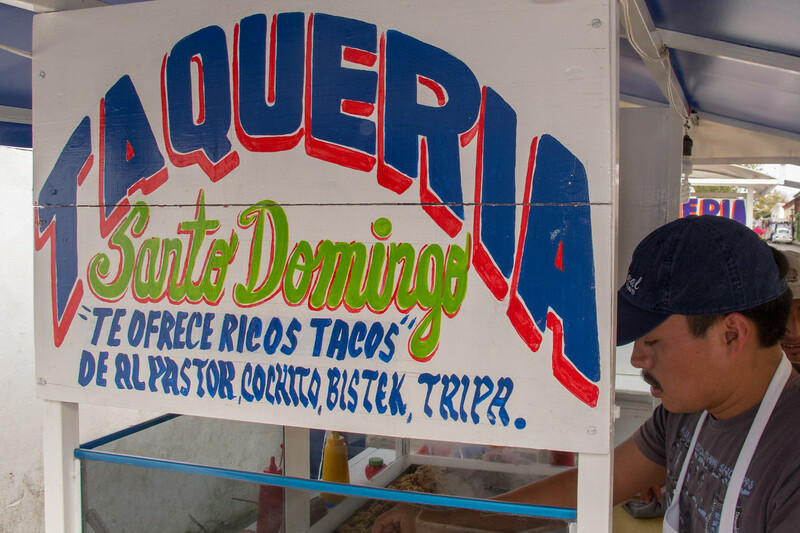 One of the best things about living in San Cristobal de las Casas was the street food, especially the taco carts. When it comes to sustenance I have a bit of a fatalistic attitude perhaps derived from downer philosopher Friedrich Nietzsche who mumbled, “That which does not kill us makes us stronger.” I guess if food is so irresistible that the locals create a market for selling it on the street, it must be okay – or at least nutritious. Okay, cheap; but possibly strengthening. Anyway, so far I have been lucky and my only bout of food poisoning came from an American “casual dining” place in the late 1980’s. I won’t say the name here but it might rhyme with “Hennigans”. Anyway, even with my luck for some reason, I hesitated when it came to eating Mexican street tacos from taco carts. Why worry? Generally, these places are crowded so the inventory turns over fast and you can watch the cooking right in front you so you have a good idea whether or not it is sanitary. The vendors want to make a tasty product because if their food stopped being good [or they poisoned a bunch of people] they would be run out of what is, after all, their own neighborhood. So several weeks ago I gathered up my appetite went to the taco stand nearest my house and proudly ordered, “dos Tacos Al Carbon por favor.” The vendor kind of gave me a funny look. I thought it was because of my Spanish (which is coming along fairly well) but maybe it was something else. Funny looks notwithstanding after a few minutes he delivered a plate containing, two small soft corn tortillas overflowing with tiny, terrific smelling pieces of browned steak and grilled green onions. I quickly loaded up my tacos with cilantro, white onion, pico de gallo, a little lime juice and a hot green sauce from the shelf around the cart. It was delicious. There was also radish, cucumber, a thin guacamole sauce and cabbage salad available to make them more filling but even with just the small amount of stuff I had put on there already, there wasn’t room left on the tiny tortillas. Two wasn’t enough to fill me up but based on the flavor I knew I would be back soon. I expressed my compliments to the chef, [and cashier, and dishwasher, maître de and busboy, it is all one person after all] and asked, how much? Well, I guess this is where the funny look came from before. The total came to about forty cents. I guess I should have gotten my clue from the other diners earlier. Most of them were ordering half a dozen, or twice that, at the same time. Two was barely an appetizer but now I know. Unsurprisingly there was no medical aftermath and I have since gone back many times to try different things. Tacos Al Pastor is probably my favorite. Tender pork marinated in spices, cooked on a vertical spit and covered with pineapple; how can you go wrong? The barbacoa, the chorizo, and the chicken are all good. I have tried the Tacos De Cabeza (meat for a pig head tacos), Tacos Tripa (tacos made for tripe) and Tacos De Carnitas (tacos made from everything else from a pig that isn’t meat (and presumably not tripe either) tacos) and enjoyed them all. I just hope that they don’t offer up something unusual one day; I would probably have to try it too. Just found your blog today and my husband and I are having a great time exploring it. We have traveled extensively in Mexico on at least 9 different occasions (with a pop-up camper sometimes and a tent other times) for 6-8 months at a time. 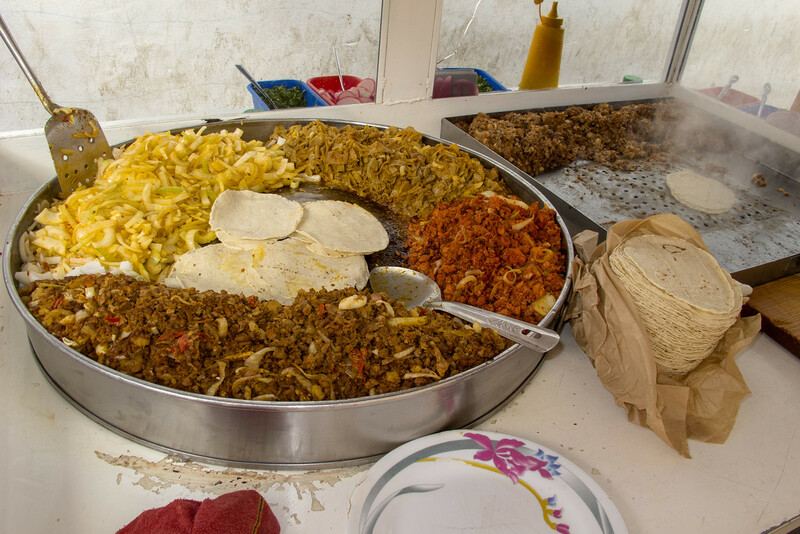 On our very first trip we were lucky to run into experienced travelers who advised us neophytes to watch for two things when eating at taco stands 1) that locals were eating there 2) that the person cooking wasn’t also handling the money unless he/she washed their hand after the money handling. Thanks guys! Look for more to come. Tell your friends.